Lockheed Martin’s Field Trip to Mars project has won the Grand LIA for both Branded Entertainment and “The New” at the London International Awards, following on from the five Gold Lions won at Cannes Lions Festival in June. As sponsor of the 2016 U.S.A. Science and Engineering Festival, Lockheed Martin launched a wider initiative, Generation Beyond, to inspire and engage the scientists and technologists of tomorrow. The Science, Technology, Engineering and Math (STEM) program is designed to inspire the next generation of innovators, explorers, inventors and pioneers to pursue STEM careers. Lockheed Martin worked with McCann New York and Framestore New York to transform a school bus into a mobile virtual reality booth driving around the streets of Washington D.C.
Framestore commissioned custom-built switchable electric glass screens that transitioned from transparent to opaque, and paired them with 4K transparent LCD displays. The bus was retrofitted to make it look and feel like any other school bus. 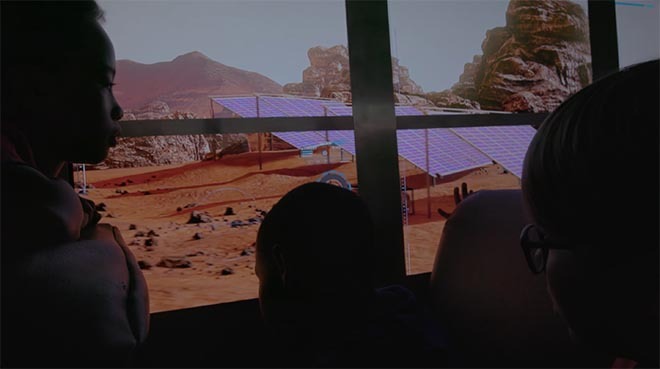 By integrating the virtual Mars surface, custom screen technology, GPS, 3-axis accelerometer, magnetometer, and laser surface velocimeter, the bus became a virtual reality “headset”, creating the first-ever headset-free group virtual reality vehicle experience. The first riders, D.C.-area students, thought they were going on a normal field trip. But as the windows transformed to reveal the Martian landscape, the riders were surprised with a field trip unlike any other. The Lockheed Martin Field Trip to Mars campaign was developed at McCann New York by chief creative officers Sean Bryan and Tom Murphy, North American chief creative officer Eric Silver, global executive creative director John Mescall, executive creative directors Vann Graves and Dan Donovan, group creative directors Josh Grossberg and David Waraksa, copywriter Joe Moon, art director Kavon Johnson, agency producers Chance Bassett, Kathy Love and Christine Lane, agency music producer Eric David Johnson, chief production officer Nathy Aviram, original content producers Sebastian Savino and Eric Perini, account directors Lisa Nocella and Rik Koletar, account supervisor Chloe Scott, strategic planners Mike Medeiros and Jessica Mendoza, and chief strategy officer Steve Zaroff. Visual effects were produced at Framestore, New York, by technical creative director Alexander Rea, senior executive producer Theo Jones executive producer Jennifer Siegel, senior producers Sue McNamara and Graham Dunglinson, executive producer Jennifer Siegel, line producer P J Stegall, production co-ordinator Cole Krug, CG supervisor Theo Jones, aAnimation lead Jim Hundertmark, FX Supervisor Ben Fox, modelling supervisor Michitaka Inoue, 3D team Patrick Ross, Xiaolai Zheng, Joseph Szokoli, Paul Kim, animation team Will Frazier, Evan Harbuck, John Burke, Flame team Martin Lazaro, Andrew Salter, systems Lead Dan Young, software developer Gary Marshall, lead Developer Ron Fosner, developers Claude Dareau, Joey Hernandez, Bill Davey, and technical director Bryan Brown.